For most students, studying for the TOEFL is a marathon, not a sprint. In other words, it takes a long time in order to prepare for the exam. Because test prep happens over weeks, months, or for some, years, it can be easy to get disorganized, causing you to forget things easily and making you waste time looking up the same things over and over again. If you've been relying on copying and pasting things into a bunch of different word documents, writing notes to yourself on post-it notes that get scattered all over, or bookmarking websites that you can't find later, you need to spend more time working on what will move you closer to your goal score and expend less energy on finding the same practice or advice again and again. So, what can keep you organized, no matter how long your TOEFL journey is? The answer is Trello. Trello is an online organizational tool that is making its mark in the online business space, but there are a bunch of different ways to use Trello, from meal planning to lesson planning. Now it is time to hack Trello to make it work for all your TOEFL needs. Trello is great for visual learners. Are you addicted to Pinterest or Instagram? Do you learn best from seeing rather than listening alone. Trello is an excellent resource for you! Trello uses boards and cards to store information. You can move things (which is great for our kinesthetic learners out there, too), create checklists, and add images for an even deeper level of customization and organization. Even if you aren't inherently a visual learner, language learning is often closely tied to visual aids, so this format makes perfect sense for TOEFL test-takers. Trello keeps your practice materials online-- which is exactly where you want it. Many students I've worked with in the past have become puzzled when they were unable to replicate the results they received from practice tests in books with scores from tests taken on a computer screen. Reading on a monitor and being able to type well are not insignificant differences from working with pen and paper. Practice books are great, but when possible try to keep your practice computer oriented. And an additional benefit is that you can learn wherever you are. 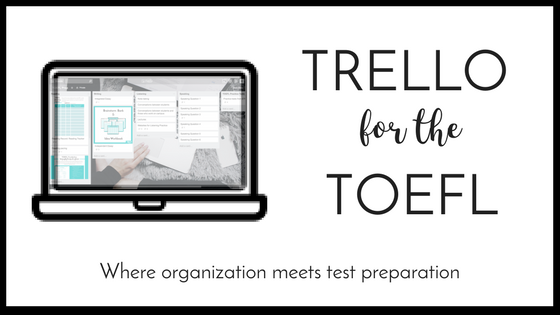 Trello has a free app so you can take your TOEFL practice anywhere. Need to study even though you are going to be traveling for school or work (or fun)? Trello comes with you so you don't need to pack your practice books. It's free, and you can't misplace it. Trello has both free and paid plans. But you can get all the features you truly need with the free version. Instead of writing down everything in a notebook that you might lose (or in several notebooks that you can never find when you need to), Trello keeps all that in one spot that you can access from your computer or even your smartphone. It integrates easily with Google Drive and Dropbox, too! Now that you know you need Trello, how do you use it? This is completely up to you, and you may find you want to add or delete items based on your personal study plan, your goal score, and your language learning needs. However, this first thing to do is to set up your boards. What boards do you need? Vocab. A perfect place to store all those words you come across, links to Quizlet decks your teachers have created for you, or downloadable PDFs that list transition words or synonyms for frequently used words. Practice Test. It can be difficult to find quality practice tests, so when you do, make sure they are easy to locate again when the time comes. Remember, you want to take practice tests regularly. Goals. Keep your eye on exactly what you are working towards. Writing it down and seeing it frequently will keep it top of mind. To Dos. Goals are great, but you want to make sure that you meet them by staying on track with your daily work. Get satisfaction by marking them off on a checklist, using a label, or by moving them into a new board labeled Doing and then Done! One board for each section (Speaking, Writing, Listening, Reading) of the exam. Within each board, create a new card for each type of practice question you will encounter test day. Keep practice problems as well as advice from experts. What should you put on each of the boards? Your own progress. Keep a log of all the speaking and writing prompts that you do. Upload them to Dropbox (or Google Drive) and then you can link them so you can locate them easily for your reference. See how your responses have changed and grown over time, or share them easily with your teacher or tutor. If this system sounds perfect but you don't want to spend the time building these boards and cards on your own (after all, that time would be far better spent learning new vocab or writing an independent essay), get the fully loaded Trello for TOEFL-takers free for a limited time. As a bonus, some of my favorite resources are already loaded into each section, saving you even more time. Now this is test prep for the modern student.